Product #1626 | SKU 1365659 | 0.0 (no ratings yet) Thanks for your rating! 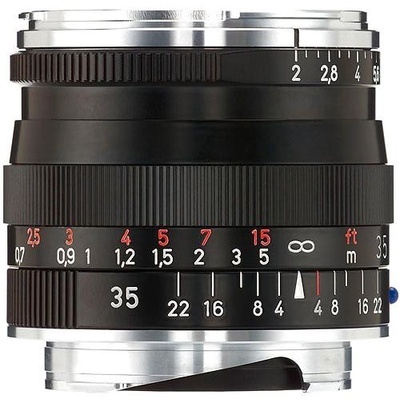 Positioned as an all-around versatile lens for general shooting applications, the black Biogon T 35mm f/2 ZM* from ZEISS is a flexible wide-angle prime for M-mount rangefinder cameras. Using a Biogon optical concept, along with one anomalous partial dispersion element, distortion is virtually eliminated and chromatic aberrations and colour fringing are well-controlled for a clean, realistic image quality. A T* anti-reflective coating has also been applied to minimise lens flare and ghosting, and, additionally, the lens's manual focus design permits working with subjects as close as 70 cm away. Biogon optical concept benefits the wide-angle focal length by helping to virtually eliminate distortion for clean, realistic rendering. One anomalous partial dispersion element reduces chromatic aberrations and colour fringing for improved colour accuracy and clarity. ZEISS T* anti-reflective coatings have been applied to each lens surface to help minimise reflections in order to provide greater image clarity, contrast, and colour fidelity. Manual focus design enables a minimum focusing distance of 70 cm.